Trifolium alexandrinum (Egyptian clover) is a widely cultivated winter annual fodder. Present work deals with inheritance of the seed coat colour in segregating progenies of the interspecific cross between T. alexandrinum and T. apertum. Although, both the parent species possessed yellow seed coat, the F1 seeds were black coloured in the reciprocal cross (T. apertum × T. alexandrinum). Seeds borne on individual F2 plants and the advancing generations segregated in yellow and black seed coat colour, which confirmed xenia effect. F2 seeds collected from individual F1 plants exhibited nine black and seven yellow segregation ratio. The segregation of the seed coat colour recorded from F3 to F5 generations revealed that yellow seed coat was true breeding (i.e. non-segregating) in this interspecific cross (including the reciprocal crosses). 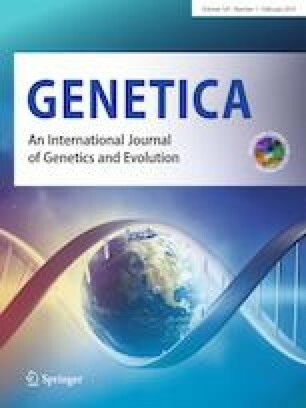 However, the black seeded progenies were either true breeding or segregated in nine black: seven yellow ratio or three black: one yellow ratio suggesting a complementary gene interaction or duplicate recessive epistasis. It indicated that the seed coat colour is controlled by complementary gene interaction along with xenia effect in interspecific crosses between T. alexandrinum and T. apertum. Occurrence of the complementary genes across the species could suggest T. apertum to be the progenitor of T. alexandrinum. Inheritance of seed coat colour in reference to its importance in Egyptian clover breeding is also discussed. Authors are grateful to Director, Indian Grassland and Fodder Research Institute, Jhansi, India for providing facilities and encouragement. Authors are also thankful to Indian Council of Agricultural Research, India for financial support. DRM contributed in conceptualization, conducting experiment, data recording and analysis, manuscript writing; AKR and PK contributed in conducting experiment, data analysis, manuscript writing; AY conducted experiment and recorded data. DKP helped in data analysis and manuscript writing. This study was funded by Indian Council of Agricultural Research, India.